to purchase coconuts to sell. Shiela benötigte 350 US-Dollar, um ein Gewerbe im Bereich Nahrungsmittel auf- oder auszubauen. Das Geld wurde gesammelt und für Shiela bereitgestellt. As a married parent of three children, Shiela works hard to support her family. She has a business buying and selling coconuts in the Philippines and earns additional income from a general store. 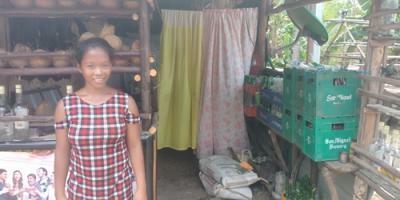 Shiela is borrowing PHP 18,000 through NWTF to purchase coconuts to sell. Shiela has been sustaining her business activities through her past 4 loans from NWTF. She hopes that her hard work will help her attain her dream to save enough money so she can afford to send her children to college.